Home Fitness	5 Things Tuesday… Reach Your Goals ! ! ! 5 LITTLE tips to help your reach your BIG goals! Do you feel like you never really reach your full potential, including your fitness goals? These 5 tips might be just what you need to step it up a notch and finally see the fruit of your labor. Just like any other habit, practice is key. Be patient with yourself, as you cannot build a six-pack in a day, some new habits may take time to truly stick, but each step in the right direction leads to a reward. It’s all nice & easy when you are well rested, inspired, and motivated. The real challenge comes when you have to push hard despite feeling lazy or stressed out! Learn how to push yourself just a little more each day, and expand your chances to greater achievements. 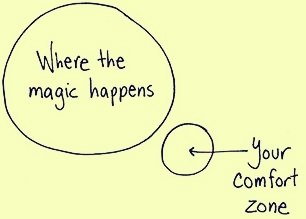 Make discomfort your new comfort and see great things happen before your own eyes! Embrace the pain as it comes, and expect to make sacrifices. Don’t worry, it’s not as terrible as it sounds, every step you take to magnify your degree of comfort will bring you new opportunities and a whole new level of satisfaction. 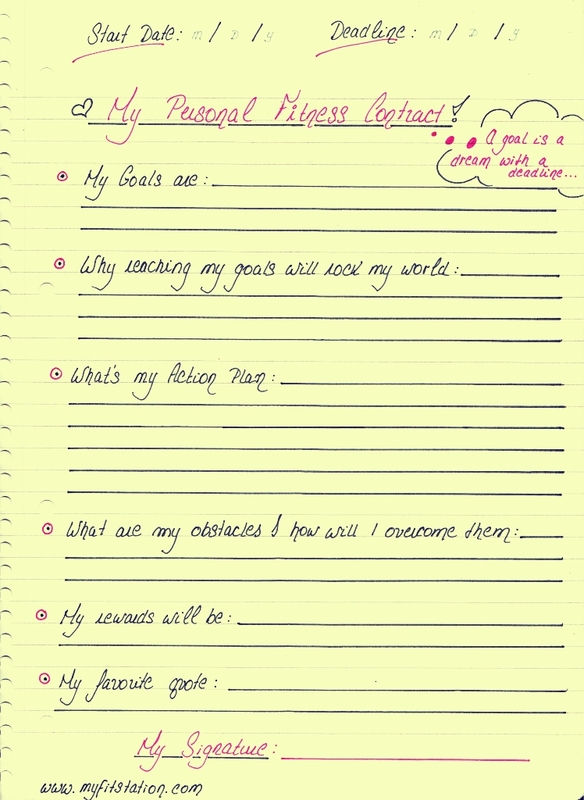 Write down a Personal Fitness Contract listing all of your goals, your detailed plan, including your deadlines, rewards, obstacles & solutions to those obstacles, rewards, and inspirations. Sign your contract and make it official. Look at your contract first thing in the morning and right before you go to sleep, take it seriously! Instead of being weak, and giving in to immediate gratification, like most people do, learn how to fully enjoy delayed gratification. Most of the instant gratifications we allow ourselves to indulge in are followed by regret. On the other hand, delayed gratification may require a little patience but the payoff is HUGE and well worth the waiting. It’s not the bad days that make us fail to achieve our goals; it’s what we choose to do once they show up. We all get them, they tend to come around at the worst possible timing and make our lives feel way more complicated than they really are. A bad day might come in the form of a negative feedback from a coworker, it may suddenly appear after your miss your bus, or it may seem like it just popped out of nowhere, for no apparent reason. Learn to expect these unpleasant emotions that overtake your mind, and get ready to kick their asses once they come along! Create a little action plan with the things you can do that might help you gain control over these limiting obstacles. Try them out, modify them if needed, and find what best works for you. With practice, you will begin taking charge of your own success, I Promise! Hope you’ve enjoyed these little impactful tips! Do you have any suggestions that have worked for you in the past, care to share? Change your FUEL: Change your LIFE ! Find Your Groove, Find Your Balance ! Getting your Figure Back Post-Pregnancy ! The Beauty Behind A Hard Workout!